If you scale up a design by multiplying all the dimensions by 1.33, will that satisfy structural requirements if the plan is followed as originally designed but with the larger members? If 1.33 is the scaled up factor, will that increase the displacement by 235%? My reasoning is that it would since 1.33x1.33x1.33=2.35, and the original scale was 1x1x1=1. For those of you who will ignore the questions and ask to know the design first, it's a 25' Nordic Folkboat. That would make the design end up being 33' 5" overall length, 9' 6" width, 5' 3" draft, 10,000 lbs displacement, 49' mast, 15' boom............a boat I could get transported by a hauler without too much trouble when I need to do that. I'm fairly certain I would be ok doing this but the one thing I want to do that does concern me is changing the planking from 5/8" lapstrake (original) to 1" carvel (scaled up). Will the carvel planking satisfy the same structural requirements as the lapstrake that is known for its stiffness? The original 1-1/8" frames will be changed to 1-1/2" frames. The frame spacing will go from 250mm to 333mm per the scale up. I would probably laminate the frames rather than just steam bent white oak frames; and all other structural members, using resorcinol. The important thing is, it gives me 6' of overall height in the cabin, LOL! I can put a comfortable V-berth up front and a chain locker, a decent galley and chart table in the cabin, and create a cabinet for the "bucket" between the main cabin berths just aft of the mast. I also think the self-bailing cockpit will be a lot more feasible and seaworthy, and there'll be more room for an engine under the cockpit that would be accessible from the main cabin. There'll also be room for a skylight over the cabin and more room to store the dinghy. I really like the design of the Nordic Folkboat but I want more space inside and outside of it. I'd also like to get the main sheet and traveler relocated to behind the cockpit if possible. If you're serious, and not just noodling, it sounds like a question for a naval architect. As a builder - my horseback estimate would be: nope. Not as you describe. But there are lots of boat designs out there. Are you talking about a boat you can build yourself, or one you'll commission? You might want to find a local builder to work with. What I do first with a client like you is create a design brief to guide our thinking. If you are serious about doing this yourself (I would recommend against that course of action, but by doing so I open myself to accusations of self-serving prejudice), I would suggest that you enlarge the lines by the factor that you desire, then refer to proven scantlings calculations methods promulgated by classification societies (Lloyd's, Det Norske Veritas, etc.) or Dave Gerr's book Elements of Boat Strength and calculate the scantlings of all structural components. After this, prepare a detailed weight estimate to determine displacement and centre of gravity of the new boat design. With lines, displacement & CG in hand, then perform stability calculations to ensure that the new boat will not kill you and your family. If this all works out, then refer to Skene's Elements of Yacht Design to calculate the sizing of the spars and standing rigging so that you can have faith that the sticks will stay in her. Or take your idea to a pro designer and have plans drawn up that will let you sleep comfortably at night. You would need to check how stability changes. It is not linear. Heeling moment from the rig does not scale linearly either. Scantlings also do not scale linear. Skene's Elements of Yacht Design sets out two methods of working out the scantlings of any yacht form, and gives guidance on calculating stability. Those dimensions don't sound outrageous. My reading tells me that you can enlarge a design 10%, and I sail a boat that is 10% larger than the original plans. She's a success. But if I wanted to go over that I would find a similar design in my preferred size range. I've also owned a dory that was enlarged 50% over the original. I was fond of her, but she was quirky for sure. Read, study, think and keep us posted. Good luck. By enlarging the plan that much and changing from clinker to carvel you are actually designing from scratch. Original Folkboat is clinker with bent frames to keep the planks together as monocoque whereas carvel would need sawn (rigid) frames to take the loads. In my neck of the woods Folkboats are known to leak on both edges of the garboards so I would redesign the floor timbers while at it. A lot easier is to find a design that fits the bill as is or can be altered by the designer. The latter is what I did. It's good to wonder as an exercise, as a way of learning the many compromises in boat design, but if your real goal is to build a boat that works, find an existing design that fits your needs. There are designs that are essentially enlarged Folkboats, like the wood 28' Kings Cruiser. If you free your mind to go with one of the many full keel excellent glass boats from the '60s you might use the fantasy exercise as a way to narrow your search for a boat. A vintage Nicholson 32 might be right for you. George, sounds like your describing the Rustler 31. £10-20k. Like a Twister, like Folkboat but bigger. 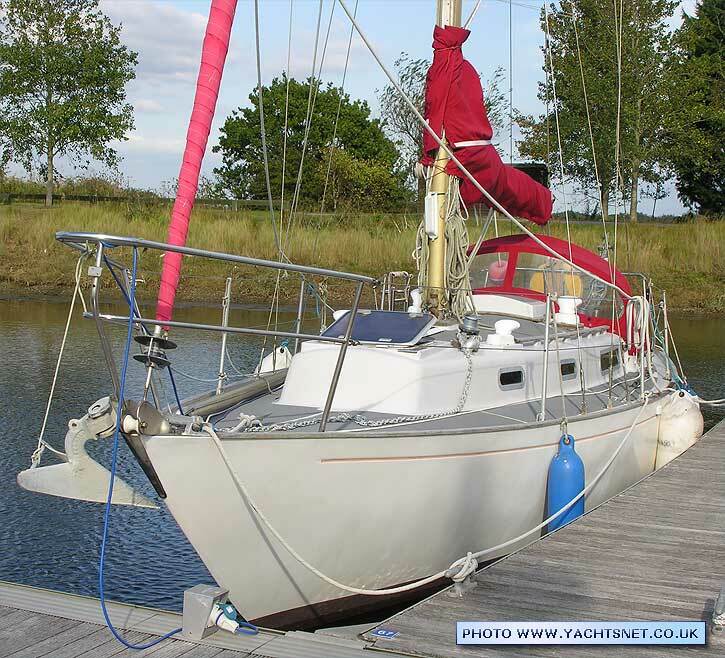 Also keep a look out for a Camper Nicholson 31. Both well made, the Nicholson more so, some Nicholson 31's ended up in the USA. The Nic is a bigger displacement though. Bigger still, the Laurent Giles 38 is the same boat as all these. A few ended up in the USA. All these boats are getting unsaleable in the UK, you'd get one for a song and no difficulty shipping accross. Last edited by Edward Pearson; 04-12-2019 at 11:25 AM. A very different collection of relationships, very stiff and under-canvased, thus nothing like a Folkboat. The scantlings will not be up to the loads imposed by the boat's stability, and she'll pull herself apart. I actually think the lines of a folkboat scaled up would not be half bad. But your displacement and therefore ballast will need re-figuring. That analysis will depend on your redone scantlings (1" carvel seems about right btw.) A first stab at the sailplan would be to see how it looks with the rig scaled to the same SA/D ratio as the original. It will probably want some adjustment from there. Compare to similar boats of known performance. So yeah, its a totally new design. Maybe a good one. Better buy a planimeter and Gerr's book of scantlings. Last edited by J.Madison; 04-12-2019 at 12:16 PM. I used to meddle with this a bit, enlarging smaller boats, sticking with the same sections and just stretching the design, but going beyond that I realized almost immediately that it was not possible to fit 75% more sail area on a 1/3 larger boat without building a freak. No. In general you would have to provide an additional 133% in shear and bending strength. In specific it would be a new structural design with new loads. Edward Pearson..............The Twister is what got me to thinking this way. TR............I understand the displacement and theoretical hull speed math, but could you show how you arrived at the other numbers? I'm not understanding how the moment of inertia is different with all proportions the same scaled up, and rotation axis should be the same. Or how stability or wetted area are different. If so, would a model sailboat that is a scaled down version of a Nordic Folkboat not perform differently? I don't think so, but I may be wrong. I'd just like to know why. J.Madison.............I did compare the structural specs in Elements of Yacht Design and found it interesting that the sizes of the frames in section do not keep pace with the scaled up size of the vessel. For example, the frame section for a 25' boat, like the Nordic Folkboat, is required to have a 3.3" square section, which would be a little over 1.75" x1.75". But the actual plans for the boat only require a 1-1/8" square frame. A 30' boat requires 4.8" of space in a frame, which would imply a requirement for a frame being approximately 2" square. I'm not sure whose specs those are since the book doesn't say. One table for keel boats does state it's a Lloyd's table. Someone else told me a table from Nevin's was in that book so I assume the table I'm looking at might be theirs. I'm also not sure if they are sawn or steam bent. One thing that was real surprising was that when I scaled the Nordic Folkboat up to fit the headroom I wanted in the cabin, a lot of other things started working out better too. The portability factor went way down but for what I want to use it for, it will probably only be trucked two different times, once to the Gulf Coast 90 miles away, and then years later across the northern U.S. to the other side of the continent. Stability is a function of transverse 2nd moment of waterplane area. L *B^3 or 1.33^4. Scale things down, ultimately to pond yacht size and you need a lot of ballast at the bottom of a deep fin keel.
. If so, would a model sailboat that is a scaled down version of a Nordic Folkboat not perform differently? I don't think so, but I may be wrong. . Scaled down models don't perform nearly the same as their full size sisters. If you look at the RC sailboats they have a huge bulb about half the hull length below the boat to keep them upright. Wind design velocity doesn't necessarily scale up or down with boat length or boat speed. So if a boat is scaled up or down, the stability changes with L^4 while overturning moment on the rig only changes with L^3. This inequality is compensated for by proportioning the L/Beam ratio with L^(1/3). If design wind velocity scaled directly with boat speed (L^(1/2)), then all sailboats would have the same L/B ratio. If design wind velocity scaled directly with boat length (L), then long sailboats would be the fat ones and short sailboats would be the skinny ones. Doesn't the wind velocity depend on the weather? Yes, but wind design velocity does not. Skene takes the design lateral force on a sail as 1.15 pounds per square foot. So design wind velocity is about 17 mph. Then he adjusts the applied lateral wind force and resultant moment for the heel angle, and balances it against the hull righting moment at that heel angle. So let's say a typical cruising sailboat would, by design, heel 20 degrees with 17mph wind and full working sail. George, all are related to the 1.33 factor, squared, cubed, etc. This process is referred to as Similitude or Mechanical Similitude, there are lots of references on line. In the case of the above list, inertia is not referring to rotational (Which is discussed in Elements), but to inertia of waterplane, which is a major factor in stability. As others have mentioned here stability is the standout change when scaling a boat, your Folkboat scaled to model size would capsize in no wind. This is why larger boats are proportionally narrower with less draft. would a model sailboat that is a scaled down version of a Nordic Folkboat not perform differently? I don't think so, but I may be wrong. I'd just like to know why. 1. Strength of materials doesn't scale with length, but stresses do. 2. Wind velocity doesn't scale with length, so need more stability as you scale down and less as you scale up. 3. Metacentric height scales with length, so roll motion gets too lazy as you scale down and too violent as you scale up. I am glad to see the constructive input from folks on the question I had. I have to admit, at first I was frustrated with some of the responses because they seemed to offer criticism without explanation. But, some have made some good points that I somewhat understand. This thread has turned into a technical discussion on sailboat design and the analyses involved in the design process. I'd like it to continue that way using the Nordic Folkboat as an example. Maybe as the discussion continues, myself, or others, can show in our discussion, how we've made certain calculations on the original size and the scaled up size, and how they would impact the boats performance providing quantitative answers. I can see this as being a big help to people in understanding how to do their own analysis to see how a boat can perform, and if it is suitable for their needs given the risk/return tradeoffs. This has always been something I've wondered about and would like to learn more about even with designs that have already proven themselves. Everyone's needs who use boats will be different in some ways. 2) Since all objects retain the same volume relationships relative to one another, the displacement value is also the same relative to the volume of the boat. The load waterline would stay in the same relative location as would all other members relative to one another in a longitudinal view and sectional view of the design. 3) Mechanical properties of materials are not proportional to their volume so the hull would be weaker relative to the forces imposed on it as the hull is scaled up in size. This is something I am not so sure is critical up to a certain point. I do recognize this happens but not so much as would make a large difference in the way wood materials are used in the design of a boat. For example, modulus of elasticity in southern yellow pine, is 1.2E for a 5x5 #2 SYP timber versus 1.4E for a 2x2 #2 SYP lumber. In fact, in some databases, the modulus of elasticity is expressed using one value for a square inch. The variation of moisture content in the wood creates much more of a difference in the structural integrity. That opens up a whole different discussion, but one that is important because design values for wood are hard to find where they've been tested for conditions that wood would be exposed to in the use of a boat hull. Especially given the lack of protection some hulls may or may not have depending on how they are maintained. 4) Not considering the effects imposed on the vessel by wind, the stability of a hull would be the same with a scaled up vessel. The center of gravity and the center of buoyancy would be the same if a vessel is scaled up in all directions. 5) But here's the big thing........When considering the effect of wind on sails scaled up by the same factor, the heeling effects on the vessel are said to not be the same. For instance, in the case where a design is scaled up by 1.33, and that would increase the displacement by 235% (1.33x1.33x1.33=2.35), the sail area reacting to the wind load would only be changed by a factor of 177% ((133x133)/1=1.77). That would cause the vessel to be significantly underpowered and the heeling effects to be not as great, unless the sail area is increased by the square root of the scale factor to the third power. In this case that would be the square root of 235%, the number 1.53. And even great question is how to achieve this in a way that is proportional to the intent of the original design. 6) I’m still trying to figure out the moment of inertia math others have stated. My assumption is that the scaled up version would still have the same amount of proportional mass and surface resistance, because the waterline would stay the same relative to everything else, and would have the same amount of moment of inertia. All this tells me a Nordic Folkboat scaled up by a factor of 1.33 in all ways, with a sail scaled up by a factor of 1.53, would perform proportionally similar to a Nordic Folkboat built to the plans. Of course the theoretical hull speed would change because of the size of the vessel and other load capacity factors would also change. But, the vessel would function the way it should. I know this is a lot, but could some folks who’ve participated in this discussion with constructive comments, respond with their thoughts on this, especially on how to achieve adequate sail power in the scaled up Nordic Folkboat version. Last edited by George Ferguson; 04-14-2019 at 12:24 AM. The problem of where are you going to put the greater sail area is a big one. Do you use a bowsprit and boomkin, a gaff or lug rig (crazy), a taller mast? It requires as much work as completely new design, and it is an unproven boat. Somewhere around here I have a professionally worked 30% displacement enlargement (with calculations) for a Yankee One Design (one of my favorites) and it is just plain ugly. The art and beauty of the original design was lost beyond recognition and there was no interest in building it. Here's another calculation I did that came up with something I'd like some of you folks familiar with SA/D ratios to comment on. Using the sail area provided by the San Francisco Bay Folkboat Association, not the Sailboat Data website which is wrong, I came up with a SA/D ratio of 15.9 for the original design. But using the scaled up sail area (177% of original), I came up with a ratio of 15.74, which is not much difference. Both are actually considered under powered since a ratio of 16 is the dividing number between under powered and reasonably good performance. I did find it surprising that the ratios were so close but I think there is a part of the equation that causes this and I'm not sure why the equation is set up that way. A boat's SA/D ratio is the total sail area divided by the displacement, where the displacement is calculated by dividing the displacement weight by 64 (seawater) and then taking that number to the 2/3 power. In the case of the original design, that is 258 divided by 16.27 (which is arrived at by (4200/64)^(2/3)). That would come up to a SA/D ratio of 15.86 for the original design. The scaled up design would be 457 (which is 258 x 1.77) divided by 29 (which is arrived at by (10,000/64)^(2/3)). That would come up with a SA/D ratio of 15.74 for the scaled up design. Reason for edit: I forgot to mention that taking the displacement to the two thirds power is what I think makes these ratios come out so close but I don't know why the formula is set up that way. Having said all that, I am going to start looking for a different boat though that is already proven. Does anyone have any recommendations? I'm wanting a design that is under 10,000 displacement, or at least close to that, that will have 6' of head height in the main cabin and room for a v-berth in the forepeak. And, I want it to be seaworthy for bluewater cruising single-handed. I'm not looking for one I could buy, but one I can build part time over the next 5-7 years by myself spending 10-15 hours per week working on it. It has to be traditional in its construction, preferably carvel planking. The issue is that I am up against the wall from a timing standpoint since I have to get my lumber cut this spring and utilize the site I've arranged to built it at. I had initially started to go with a larger design. I'd seen the spidsgatter Pax and wanted a boat like that but I can't get the plans for it. I'd found some lines drawings and lofted out a hull shape using those lines drawings but I do not have a construction plan and I'm not confident specifying the structural members, rigging, sail plan, etcetera, where I'd be confident that I would have a good boat once I'd completed the build. I like double enders. The Colin Archer and K.Aage Nielsen designs are very attractive to me as well, but I can't find a complete set of plans for those designs either that I could buy. I think the look of the cabin and how it blends with the exterior of the boat is important. Some designs, like Atkins, have very boxy cabins that aren't as attractive to me. The designers I just mentioned and Herreshoff all had cabins that seemed to blend with the exterior in an exceptionally good way. Lyle Hess has boxy type cabins but somehow the cabin on the Bristol Channel Cutter blends while the one on the Falmouth Cutter 22 doesn't, in my opinion. A Newport 29 by Herreshoff is what suits my fancy but design is well over the size that would work for me due to time constraints. Both SA/(Disp)^(2/3) and SA/Wetted Surface ratios scale up just fine. Your sail plan scaling is off. Rig overturning moment goes with L^3 while righting moment goes with L^4. To correct this you would scale up your rig dimensions by 1.33^(4/3), so 1.46 not 1.53. Or you could reduce the beam. Strength and stiffness of materials needs to be compensated for when scaling. For example, scale-up the frame dimensions by 1.33 but do not scale-up the frame spacing. This increases the strength and stiffness the required additional amount of 1.33. My thoughts? As a designer? The cost of a custom set of plans is but a very small fraction of the cost of the total boat build and fitout. But if you just do a scale up and get it wrong the result wont give you a good result for your investment. While its not rocket science for some of us, the fact that you've felt it necessary to ask for assistance here suggests that your knowledge of marine design is not up to the task, and while I appreciate that you're trying to improve on that, I think that the scope of the project is such that some professional input, beyond what the several knowledgeable people here have contributed, would be a very good idea. As to the "scale up". I'd start with a brief that included the characteristics of the Folkboat, and start from there with a complete new design. Well said John. As a professional boatbuilder and repairer I will say “Long live the dedicated amateur builder” But this Forum also has lots of professionals that would be happy to be paid for their services, be it Design, Building, Repair, Sailmaking, Rigging, Painting/Varnishing, etc. There is no way to shortcut to gaining professional experience. I learn a lot by reading this Forum, but I learned my trade working full time for years. Stretching a small craft by adding a few inches more between stations is relatively simple and safe for the end user, multiplying all dimensions by arithmetic will yield a lot of volume but will probably result in, at best, a crank boat, or a real disaster. John, while I appreciate that you think marine design is "not rocket science for some of us", I don't think marine design is rocket science for the rest of us. Rather than respond in such a condescending way, why not try and provide some constructive input if you have any? I enjoy discussions of this nature for the sole purpose of learning, as do others. Your recommendation for me to utilize the professional services of someone who is capable of providing me with the information I need to build a successful boat that meets my needs, is good advice, just like others have also done on here. But individuals communicating back and forth on this forum, whether they are professionals or not, is a productive way for information to be shared. I know that its hard for some to embrace new ideas, or think they are above benefiting from the contributions of others thinking, but they aren't. New ideas and change should not make others feel threatened and cause them to try and diminish what others have to offer. If society moved forward in that way, the chronometer may never have been invented. Lets be nice and try to offer positive input in this discussion. As advice goes, this is the most bang for the buck you will ever get on your entire project, if you are at all serious about building a boat. Listen to the man, he knows what he is about. Whether you hire him, or Tad Roberts or one of the other professional designers who have chimed in so far here, it will literally save you money and time overall. Consider that, by your own estimation, you are willing to put in between 4,000 - 5,500 hours of time doing this - isn't it worth it? Paul, I think your comments stating, "this Forum also has lots of professionals that would be happy to be paid for their services, be it Design, Building, Repair, Sailmaking, Rigging, Painting/Varnishing, etc." provides substance to my thoughts as to why certain individuals appear to feel threatened by technical conversations on this forum that "professionals" may feel infringes on knowledge that provides them with their livelihood. You yourself also stated, in that same post, that you learn a lot by reading on this forum, but then you go on to say that you learned your trade by working full time for years. So why not contribute back to the forum by contributing to the discussion that will also help others learn? I'm not saying that you don't contribute in a positive way. You just might be, including topics I've used this forum to learn about. But don't try to diminish the collaborative efforts of those who you don't consider to be "professionals" but classify as "amateurs". I've read through a lot of comments on this forum just like the one you posted that I am responding to and usually ignore them. I'm responding to yours and John's because I don't think the intent of your comments are productive for those trying to also learn from others on this forum. In fact, to some folks that don't react well to confrontation, they could be intimidating, rather than what they really are, a feeling of being threatened by others. So if you don't have anything productive to say that would be helpful to others, I'd rather you just didn't say anything. Your recommendation to use the services of an experienced designer is good advice! but I also like to learn the technical matters of the subject and will continue using this forum to do so! .............I say this with complete appreciation for your advice, and do not at all feel you are commenting with the same intent as the last two fellows I've responded to on here.